The sketch which informed Albert Bierdstadt's epic masterwork 'Last of the Buffalo" in the permanent collection of the Buffalo Bill Center of the West. See finished painting below in story. What is the role of a visual artist? Most painters, sculptors, photographers, filmmakers, dancers and even musicians and architects don’t create or perform only for themselves. By choosing to share their work with the larger world they are inviting public engagement. As a writer who has written for several decades about artistic interpretations of the natural world, especially wildlife art, sculpture and landscape painting in the West, I’ve often pondered this question: what is the responsibility, if any, that the artist has? If it is not to invite a deeper level of feeling achieved through touching the viewer's mind and heart, then what is the point? Anyone, with a little bit of time, can learn to paint a pretty picture or the side of a house. It’s the daring artist who makes an image purposeful beyond the category of mere decoration or window dressing. While painter Thomas Moran and pioneering photographer William Henry Jackson came to the Greater Yellowstone region in the early 1870s in part to be chroniclers of a new national park being proposed—let us not forget it was a destination promoted by the Northern Pacific Railroad in an attempt to lure paying passengers from the East—they became pathfinders in another profound way. Owed in large measure to the power of Moran’s paintings and Jackson’s photographs displayed in Washington D.C., members of Congress—most of whom would never set foot beyond the Mississippi River—took courageous unprecedented action. They established Yellowstone National Park as the first of its kind in the world. Yes, they created Yellowstone on faith that it would serve a higher public purpose in perpetuity. Art advanced wildlands and wildlife conservation and in the years since, it has been foundational to a movement of environmental protection that has made America the envy of the world. Even something as tiny as the federal Duck Stamp, carried in hunters' wallets, has generated close to a $1 billion and protected almost six million acres of wetlands vital to the survival of hundreds of species. While many artists use nature as their muse, unfortunately not all give back to conservation, and only a few ever achieve the noble distinction of having their work become a touchstone for history. 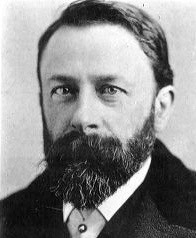 One of the giants whose perspective helped to shatter America’s myth of Manifest Destiny—of an infinite landscape there to be exploited in the name of God without regard given to limits—was Albert Bierstadt. 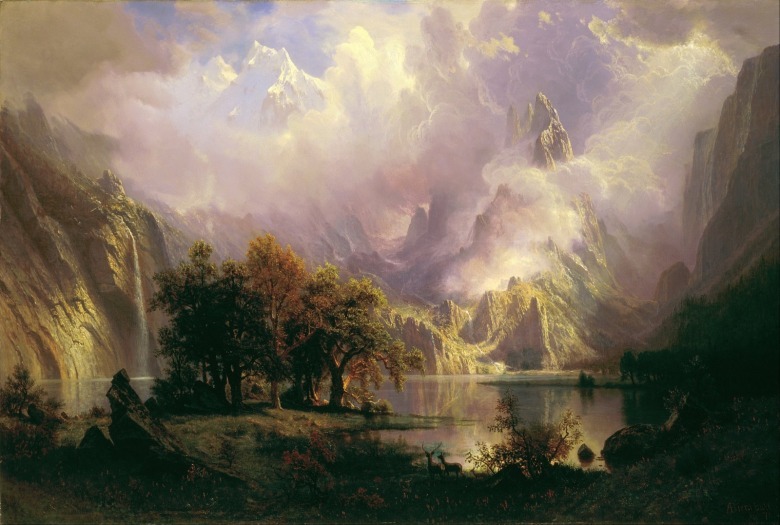 In Cody, Wyoming through the end of September 2018, there is a remarkable exhibition of Bierstadt’s work, the first stop on a national tour that will next travel to the Thomas Gilcrease Museum in Tulsa, Oklahoma. "The Rocky Mountains, Lander's Peak" (1863) in Metropolitan Museum of Art, New York City. 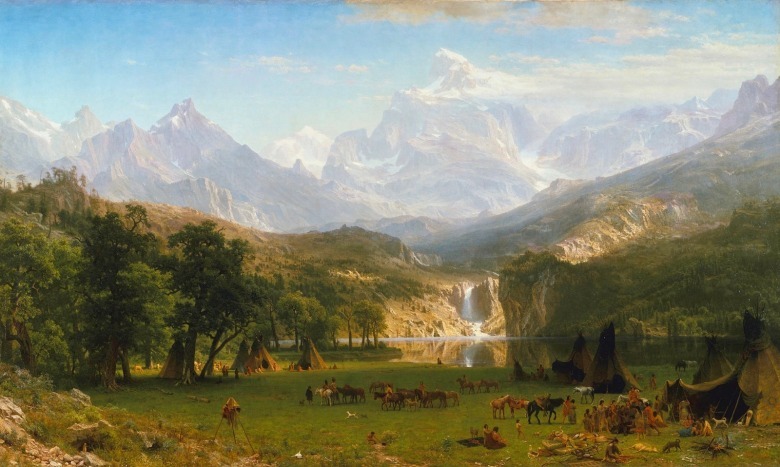 This painting, completed while the Civil War was still raging and 27 years before Wyoming gained statehood, conveys the scene of a Shoshone encampment alongside the Wind River Range. 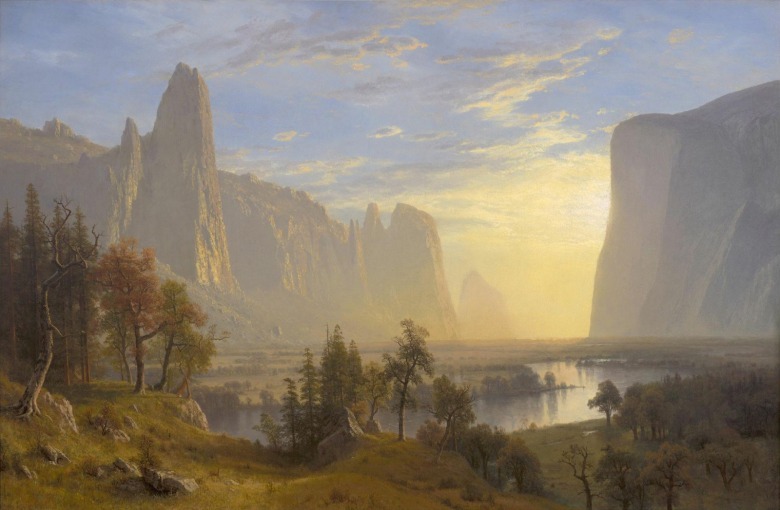 Bierstadt’s work is regarded as nothing less than a national art treasure. Scenes from his corpus are displayed at the National Gallery in Washington, D.C., in The White House, and at the Metropolitan Museum of Art, as well as numerous others in the US and abroad. 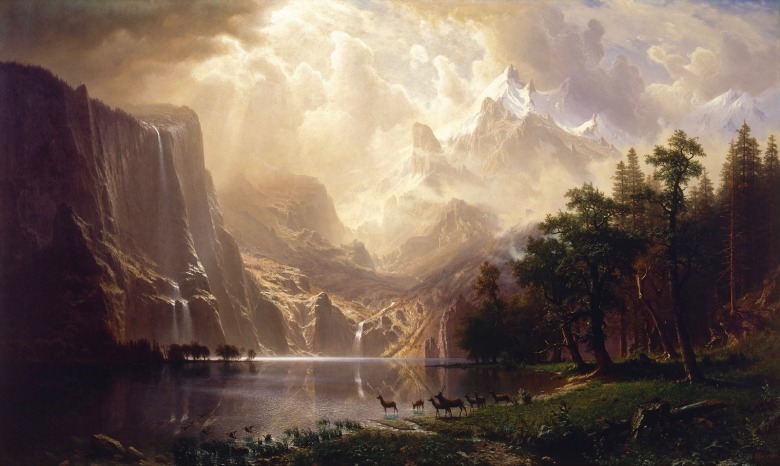 That the exhibition, Albert Bierstadt: Witness To A Changing West, premiered at the Buffalo Center of the West’s Whitney Western Art Museum in little Cody, Wyoming is testament to the unlikely global prominence of the venue. The exhibition, which runs through Sept. 30 in Cody, is curated by the Center’s director emeritus Dr. Peter Hassrick, as a labor of love, and by Karen McWhorter, the Scarlett Curator of Western American Art at the Buffalo Bill, and Laura Fry, who serves as the Gilcrease’s curator of art. Having seen the show twice, I will say this: the grouping of works is, in a way, both mind-bending and spell-binding, for it puts us into the mind frame of Bierstadt himself. Through his brushstrokes we are one narrow degree of separation removed from breathing in the 19th-century air, feeling the lilt in Bierstadt's soul and knowing his sorrow. The German-American (1830-1902) came West in the 1860s and kept returning through what was considered the last gasps of “the frontier.” While he observed almost ineffable wonder and natural beauty, Bierstadt also saw unspeakable acts—government-sponsored genocide committed against the indigenous people of this continent, wholesale slaughter of bison, and clearing lands of wildlife to eliminate predators and competitors of grass for cattle and sheep. Bierstadt's "Geyers in Yellowstone" (circa 1881) in the Whitney Museum of Western Art permanent collection in Cody. The Buffalo Bill Center of the West is to be commended for boldly using art as a platform for advancing a new discussion; for reassessing the mythology of the West and matching it against the hard wincing truth of reality. The federal government’s deliberateness is waging a war of extermination against native people and bison represents a long shadow—an unremovable stain—in our national psyche. And yet it is only by confronting the shadow and trying to make sense of it that illumination can be achieved. Bierstadt’s masterworks, assembled in Witness to A Changing West, convey a visual narrative and reveal his own agonizing struggle to highlight the tragedies. 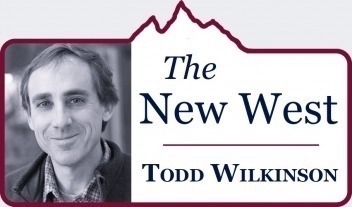 At the same time, his romantic panoramas of the Greater Yellowstone region—especially the valleys around the Wind River mountains of Wyoming—as well as his epics like views of Yosemite Valley in California, are visions for the ages. One of the most famous paintings in U.S. history is Bierstadt’s 1888 work, “Last of the Buffalo.” There were two companion versions rendered. One hangs at the National Gallery in Washington D.C. As for the other? 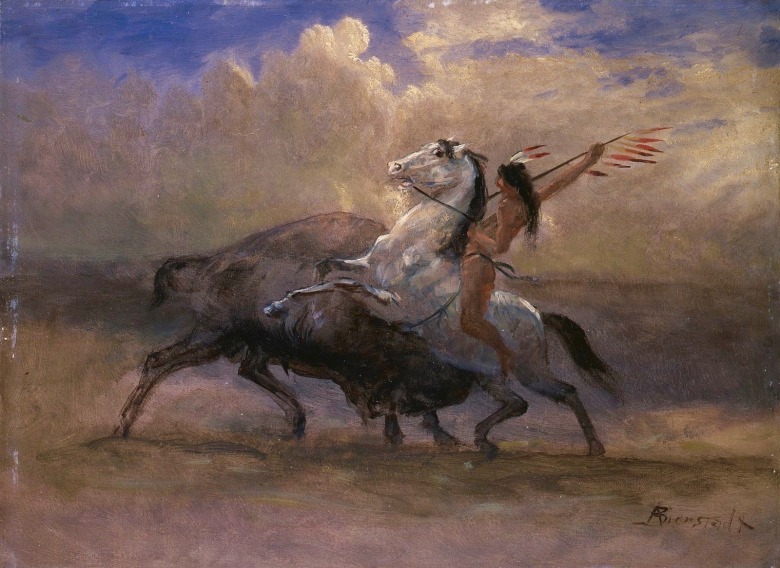 It’s in the permanent collection at the Buffalo Bill Center of the West and is showcased in the exhibition. The Buffalo Bill also has one of the original sketches that informed it. 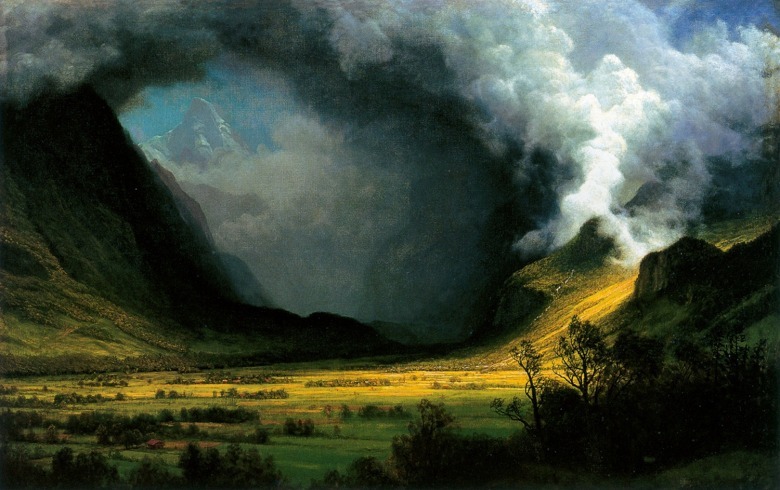 The epic was inspired by Bierstadt's visit to the Wind River mountains in Greater Yellowstone. "Last of the Buffalo," according to the National Gallery of Art, is considered Bierstadt's "last great western painting." An art historian at the National Gallery writes: "By the time Bierstadt painted this canvas, the buffalo was on the verge of extinction. The animals had been reduced in population to only about 1,000 from 30 million at the beginning of the century. Scattering buffalo skulls and other bones around the deadly battle, Bierstadt created what one scholar described as "a masterfully conceived fiction that addressed contemporary issues" - one that references, even laments, the destruction wrought by encroaching settlement. "However, at about this time, efforts to preserve the buffalo began to garner support. In 1886, when Smithsonian Institution taxidermist William T. Hornaday traveled west, he was so distraught by the decimation of the buffalo that he became a preservationist. He returned to Washington with specimens for the Smithsonian and also with live buffalo for the National Zoo, which he helped establish in 1889—one year after Bierstadt completed this painting." 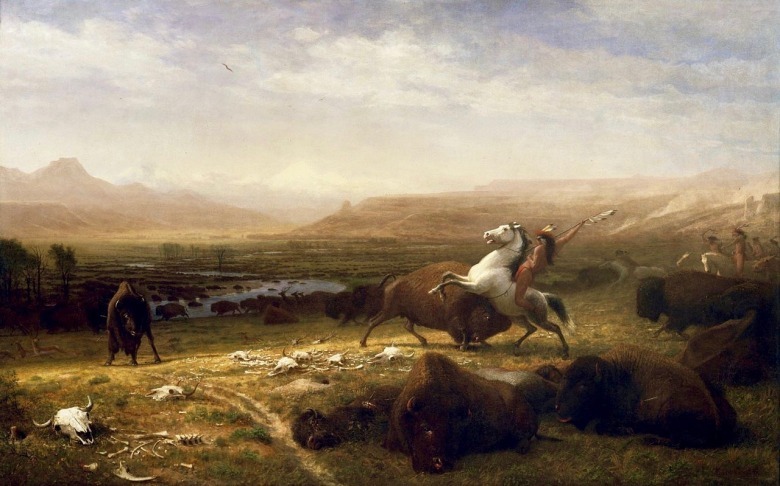 "Last of the Buffalo," Albert Bierstadt's American masterpiece. 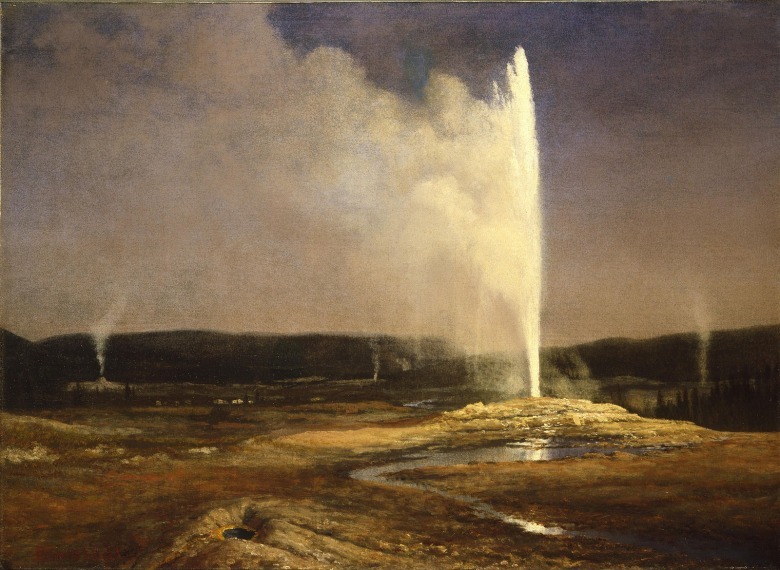 One version hangs in Cody, Wyoming, the other at the National Gallery of Art in Washington D.C. Thanks to the tutelage of Hassrick, McWhorter and Fry, the code Bierstadt was communicating is revealed and explained. 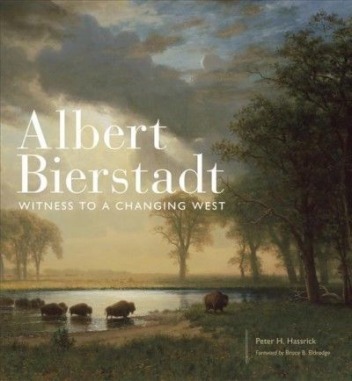 Hassrick, an eminent scholar on Western art, is also author of a companion coffee table art book, Albert Bierstadt: Witness to a Changing West, a signed copy of which can be purchased through the museum. Buy it; it's magnificent. What is the role of artist? Bierstadt set a high standard for what is possible as witness, as documentarian, as allegorical commentator speaking to the tenor of his own time. Autumn is the glorious season in Greater Yellowstone, the time when locals, having been bombarded with visiting guests and having abstained from venturing into the crowded national parks, claim the serene peace of the region back again. Often, it means setting out on daytrips. You could spend thousands of dollars flying cross country to see Bierstadts in the nation’s capital or New York City. For the cost of a tank of gas and a little more, you can instead soak in a rare assemblage of Bierstadts as moving as any you’ll experience in a lifetime. Best of all, the exhibition is overlapping with the 37thAnnual Buffalo Bill Art Show and Sale on September 21-22, 2018. 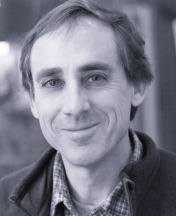 Note to readers in the Bozeman area: Peter Hassrick is giving a lecture on the exhibition at the Museum of the Rockies on Tuesday, September 18that 7 pm in event sponsored by the Bozeman Public Library. Don’t miss it.